Jordan’s particular focus will be executive education which he sees as an integral part of the highly specialized focus of the new Management School. The UCSD Management School was approved by the UC Board of Regents in 2001 and its programs, scheduled to begin in the fall of 2003, will be designed for technologists who need to obtain broader management skills and business savvy and for general managers and business people who need to understand new technologies and the strategic and marketing implications of these new technologies. Its students will run the gamut from experienced mid to high level executives and technical managers from local, national, and international business firms, non-profits, and governmental organizations who are seeking to recharge and fine-tune their skills to younger graduate students charting a course for entrepreneurial success in degree programs. Jordan comes to UCSD with 25 years experience helping entrepreneurial minded academic and commercial organizations expand into new markets and pursue new activities. Prior to joining the UCSD management team, Jordan was president of Mesa Systems Guild, Inc., a leading provider of web-based product development tools and consulting. Under his guidance, the organization obtained multiple rounds of venture capital financing, focused on key accounts, and enhanced product offering to meet the needs of several Fortune 500 firms. Before Mesa, Jordan served on the faculty of Carnegie Mellon University in Pittsburgh as an adjunct professor of entrepreneurship and developed and taught masters level courses in entrepreneurship and sales force management. He also served as director of the Executive and Professional Education Center for the School of Computer Science and the Graduate School of Industrial Administration that experienced a six-fold revenue increase under his direction. At UCSD, in addition to his own managerial duties, Jordan will develop and teach graduate courses in executive education. He describes his typical executive student as one who has an undergraduate degree, works for a few years, goes back for an MBA, gains more experience working, then perhaps takes a two-week high-power general management course, and works a few more years. At least, that’s one niche. The Management School faculty will cast a widely specialized net. To accommodate a broad range of mid to high level executives seeking to re-ignite innovation in their already keen business and technological capabilities, the Management School, beginning in the fall, will offer two to five day customized forums focusing on the specific needs of individual clients or groups of clients. These forums may be in partnership with other units at UCSD, such as the Jacobs School of Engineering, the Medical School, the Graduate School of International Relations and Pacific Studies, University Extension, and others. “By partnering with other UCSD units, we look to become a one-stop source for personnel development,” Jordan says. In addition to the short-term specialized executive programs, the Management School will offer a 24-month innovative and flexible curriculum leading to a Masters in Business Administration, joint degree programs with other schools at the university, and a select Ph.D. program linked to the research emphases of the Management School faculty. The first MBA program will begin in the fall of 2004. Jordan says one of the most important things that will be taught the executives is how to effectively interact with colleagues from other functional areas. For example, engineers or other technologists will be taught how sales people see the world, and how to adapt their presentation to appeal to the end-result-oriented sales person. 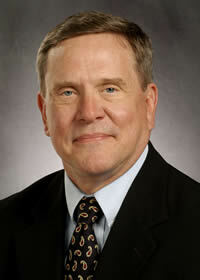 In addition to Mesa Systems Guild, Inc. and Carnegie Mellon University, Jordan served as vice president of European Operations and vice president of the Hybrid Products Division of Pulse Engineering, Inc., managing its product development, marketing and manufacturing facilities around the world. He has held management positions with Rockwell International and George-Good Corporation and has sat on the board of directors of several startup enterprises. Jordan received a bachelor’s degree in electrical engineering from Stanford University, an MBA in international business and finance from Columbia University, and a Ph.D. in manufacturing and operations systems from Carnegie Mellon. Jordan also foresees the UCSD Management School developing its own programs in leadership and communication, which he terms “softer skill development,” and in five to six years projects having 1,200 to 1,500 executives going through these courses. “We hope to build a reputation for being the place to come for advanced skills development,” says Jordan.